If there's a skill that you ought to pick up on if you haven't already it's how to clean a handgun magazine. Yes, your magazines need to be cleaned just like your pistol does. Every so often, you'll need to take them apart, clean them, then reassemble to keep them in good working order and ensure better operation. Along with periodically replacing your magazine spring cleaning and lubricating your magazine periodically is a necessary bit of regular maintenance that will keep your magazine in good working order. 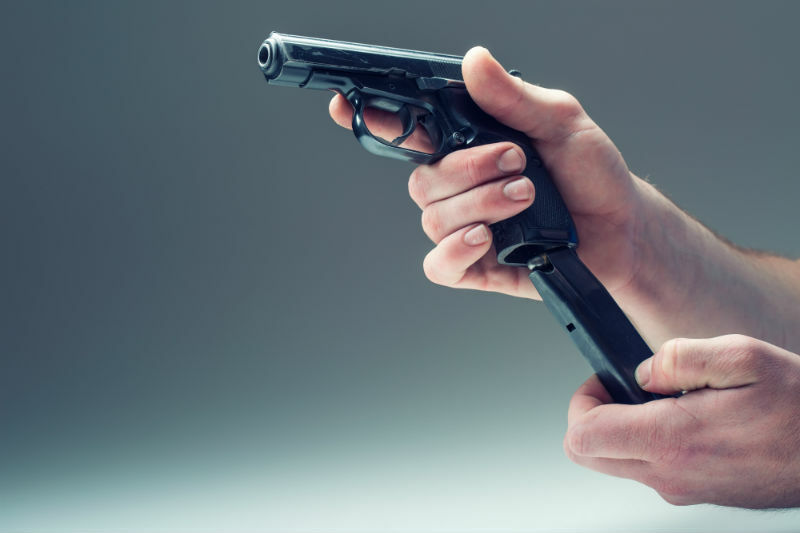 Magazines, as we all know, are one of the most likely sources of mechanical failure in a semi-auto pistol, so you need to do what you can to keep them up. We'll go over magazine cleaning procedures. The good news is that there are pretty much two designs of magazine on the market to be aware of, with only a minor difference or two between them. The former is much more common for double-stack pistols, though it isn't by any means exclusive to them. The latter is more common with single-stack pistols, such as 1911 pistols and so on. Take your magazine and have a look at the baseplate. Is it obviously slid onto the magazine tube? Then you have a removable baseplate. Is it clearly not meant to be taken off? Then you have a fixed baseplate. That said, you actually can remove the baseplate on some "fixed" magazines...but what you'll notice is that it takes some doing to remove it. Normally, you're only going to run into this on 1911 magazines, but you might with magazines that belong to other pistols. This is a clue, and namely that you shouldn't do that unless you absolutely have to. So, if the baseplate clearly is meant to slide off, you can do that. If it clearly doesn't, leave it alone. Now that we have that out of the way, let's get down to cleaning. Before we clean the handgun magazine, we must disassemble the magazine, which is pretty easy. As previously mentioned, this type of magazine is more common with double-stack guns like most Wonder Nines and similar gun. First, you'll notice a hole in the baseplate. The bottom turn of the magazine spring will have an indentation, which indexes in this hole. 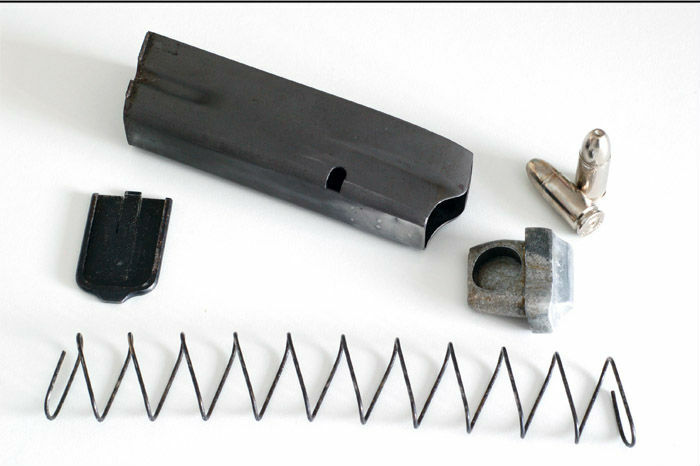 To get the ball rolling, take an Allen wrench, a punch, awl, or even the end of a pen, and push the magazine spring indent out of the hole. Once the baseplate is removed, let the spring tension out in a controlled manner and then pull out the spring. Make sure to note the orientation of the spring when removing it, as it will need to be replaced in the same manner. The follower will simply drop out. To clean, use either a magazine cleaning brush or a specially-purposed toothbrush and lightly coat it with gun solvent. Go over the magazine tube until all deposits have been removed. Repeat with the baseplate, the follower and the spring. (A toothbrush works well on the spring.) Be sure, however, not to use a caustic cleaner (alcohol, for instance) on plastic followers. Wipe away excess cleaner, and apply a light coat of oil to the magazine tube, the spring and if called for by the owner's manual, the follower. Wipe excess away. Reverse the steps you followed to disassemble the magazine, starting by gently dropping the follower into the magazine tube. Then just follow those steps in reverse order, culminating in sliding the baseplate back into place the the indentation in the spring locking into place. For a 1911 magazine or magazine of similar design, with a fixed baseplate (or more accurately, one that isn't designed to be taken on and off with relative ease) the steps are slightly different when it comes to how to clean a handgun magazine of this design. However, not that much different. With this design of magazine, you take components out through the top, rather than removing the bottom. There are a couple ways to do it. The more primitive method is to push down on the back of the follower and thereby depress the spring. You tilt the front of the follower up and lift out from the front of the magazine. Then you pull out the spring. Or you push the spring about a third of the way down with a pencil or something like that. Stick a punch, a matchstick or any object through the holes in the magazine. This holds the spring in place and frees the follower. Remove it from the magazine by pulling it up and out of the front of the feed lips. Once the follower is removed, remove the spring. 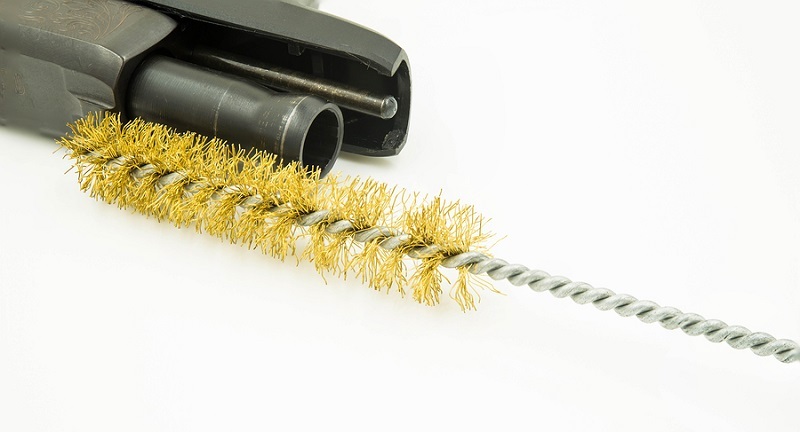 Use a magazine cleaning brush or toothbrush with a light coat of cleaner to clean the magazine, the follower and the spring just as you would with a box magazine with a removable baseplate. If desired, give the spring and the magazine a light, uniform coat of lubricant. Now you insert the magazine spring back into the magazine housing, with the same orientation prior to removal. To reinsert the follower, you'll notice a tang on the bottom of the follower. This hooks to the top wind of the spring. Attach the follower, and bend the follower and spring forward, so you have the rear of the follower at the front of the magazine. Rock the follower backward, so the rear of the follower inserts into the magazine first and the rest follows, getting under the feed lips until the follower is fully into the magazine. And there you have it - how to clean a handgun magazine for pretty much any pistol that takes one. Regularly cleaning magazines is something that should be done as a matter of course, just like cleaning and lubricating your gun. The requisite tools should be in the toolbox, but the good news there is all you basically need is an old toothbrush. Just like cleaning your gun, you should be doing it after range visits, especially if you're firing 50 or more rounds per session. 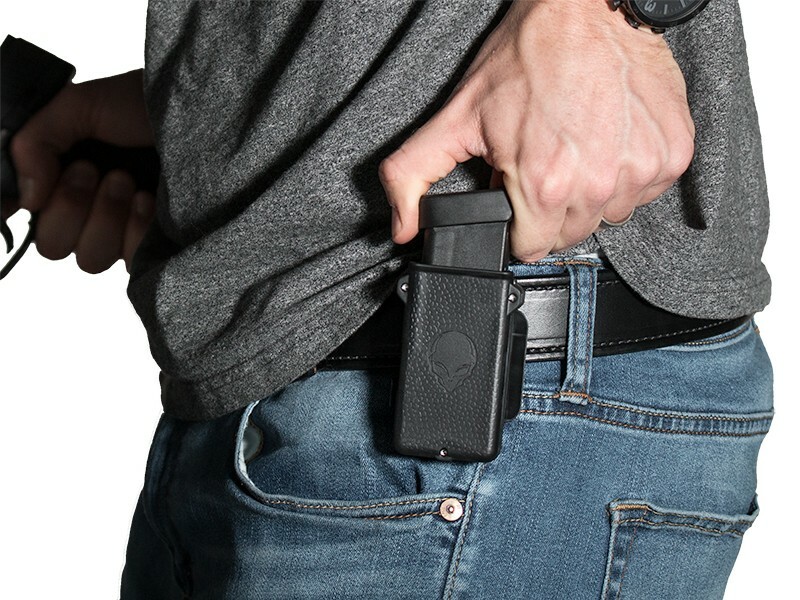 This is especially important in a carry gun, as it needs to be kept in good working order. 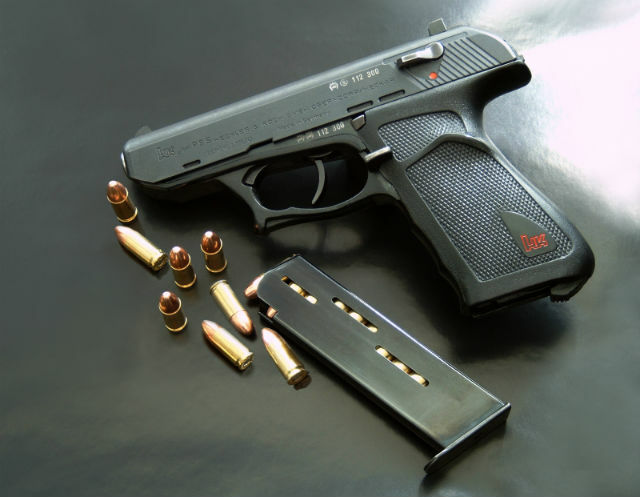 After all, your life may depend on this gun working and the magazine is the most common cause of malfunctions. However, you will want to take it easy on the lubricant. Unlike getting the rails of your pistol good and coated, lubrication should be minimal with magazines. Some people don't even use it; they just get their magazines clean and call it good. Keep them clean and they'll work better. Toss in a new spring every year or two and you'll get a very long service life from them as well. It's the only part of a magazine that's likely to wear out and they're cheap, so don't be shy about swapping them out.